Bureau's Sugarhouse Maple Kettle Korn is made using the finest Non-GMO Mushroom Popcorn. The kernels pop up very large and fluffy in a blend of 100% pure canola oil. At the moment the kernels start to pop, we add our special blends of cane and maple sugars into the hot popcorn and oil. It then takes approximately 20 seconds for the 4 pound batch of popcorn to pop up with a roar! The hot maple caramelized popcorn is quickly transferred into our large copper receiving kettle where we add our own pure maple sugar once more to give it even more maple flavor, along with just a hint of popcorn salt. The resulting product is one which has the complex flavor, aroma and color that only natural maple sugar can provide. In short, it is popcorn that is golden, crispy, fluffy, slightly sweet and salty with a great maple taste and aroma. 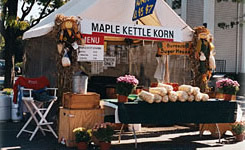 You can order our delicious unique Maple Kettle Korn by mail. We keep the process simple and efficient. We will send you Two 1 Pound, Five (6) ounce or eight (4) ounce Bags of Fresh Maple Kettle Korn heat sealed in a 3 mil flavor tight polypropylene bag via priority mail anywhere in the continental United States. Our display booth at one of our events.